Head over to get this Shopkins Disco Ball Karaoke for ONLY $24.96 (Retail $70)! Add a little Pizazz and sparkle to your next karaoke party with Shopkins Disco Ball Karaoke Machine. Printed on the front of this machine are your favorite Shopkins characters, from Apple Blossom to Lippy Lips. More than just your average Karaoke system, this machine boasts a shimmering disco ball that dazzles your dance floor with varying and vibrant light patterns to really take your Karaoke party to the next level. This retro designed karaoke machine features a lightweight microphone that wont interrupt your performance. 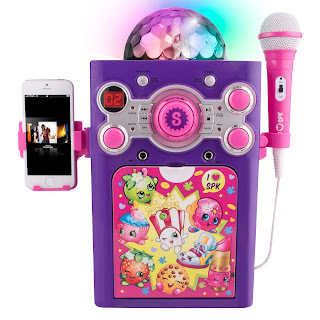 Connect your mobile device and sing along to all your favorite jams with Shopkins Disco Ball Karaoke Machine.